So, what was going on in the BMW booth? A lot of electric stuff. A lot of ‘M’ stuff. A lot of carbon fiber. It seems you can get a M Performance version of just about any model BMW now- much like how you can get an AMG Mercedes everything. What do you get for the extra Benjamins dished out for the M Performance packages? Fancy carbon fiber exhaust temps with the M logo etched into the tips for one. Yeah yeah, sorry for the funky angle. I was trapped by a couple tall pillars that prevented me from taking a better angle. 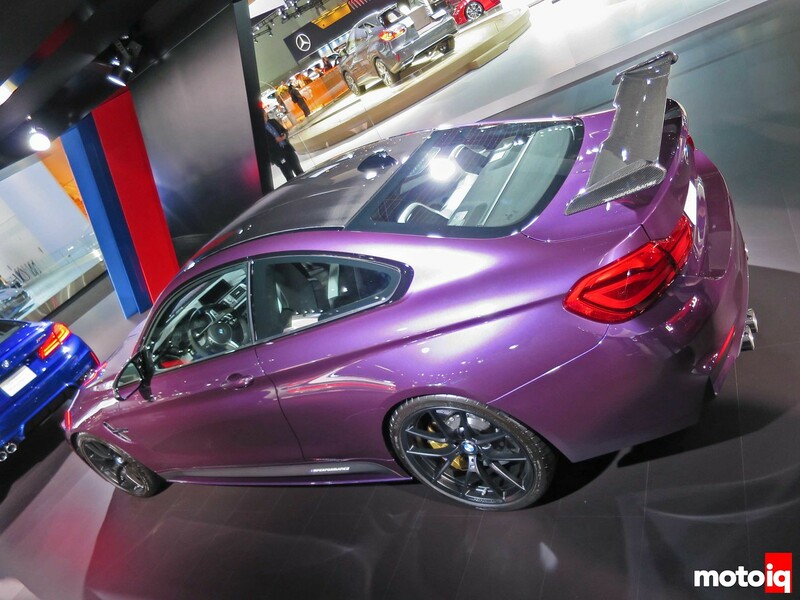 This is the M4 in a color that’s… like pearl iridescent eggplant. A carbon fiber roof and rear wing are prominent features. ‘//MPERFORMANCE’ stickers are located on the ends of the wing and also on the lower side sill. The wing is located kinda low so you can see how the wing element is angled to best interact with the airflow coming over the top half of the car. Here’s another view of the angle of the rear wing element. I am a bit curious about the design of the endplates of the wing. It would have been easier to just make them flat plates, so BMW saw some functionality in tipping over the tops of the endplates. Perhaps they limit the curling over of the high-pressure air on top of the wing element and/or minimize the size of the vortices coming off the wing tips. Any aerodynamicists, feel free to chime in. See those two tall spokespeople to the right? Those were the tall pillars causing the funky angle in the previous picture. 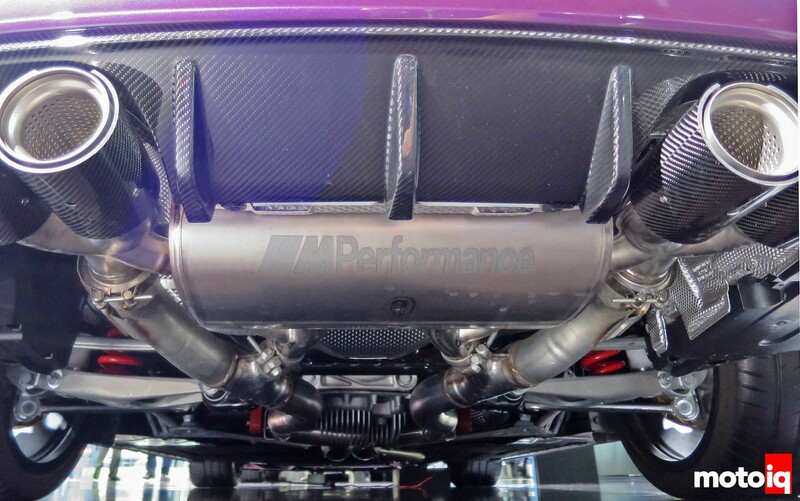 I don’t know how many M4 owners go crawling underneath their cars, but if they do, they’ll be greated by the //MPerformance etched into the muffler. BMW uses a mix of v-band clamps and more standard muffler clamps to attach the rear muffler section to the intermediate pipes. The rear diff has massive heat sink fins on the case for cooling. Heat shielding is used all around the muffler to protect the rear of the car; I suppose to help prevent heating anything in the trunk in case people go grocery shopping in their M4. 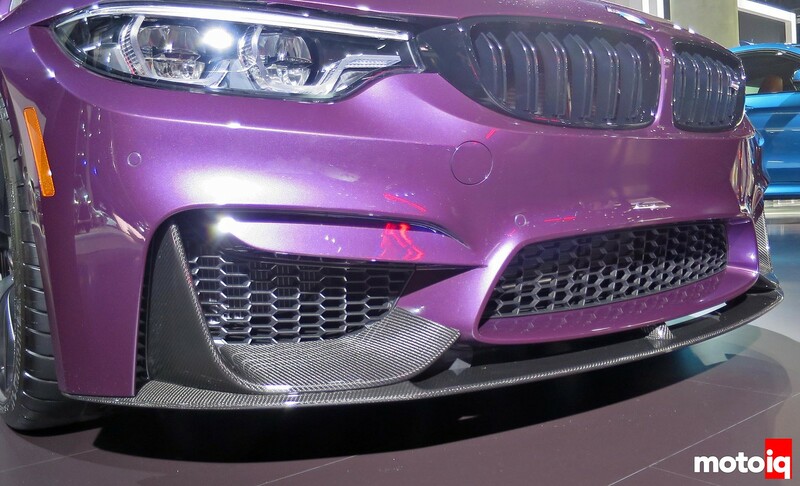 More carbon fiber treatment is featured at the front. There’s lots of frontal opening area for all the heat exchangers required to keep the M4 from overheating on the track. I’m a little surprised there’s a gap between the chin spoiler and bumper, but I’m sure there’s an aero reason for it. Project “My Fiancée’s” Miata: Part 10 – Nitto NT05 Tires, Exedy Stage 1 Clutch & Flywheel, Two Track Tests and Road Trip Bonanza!